Have you ever tried the Chicken Salad Chick Egg Salad? 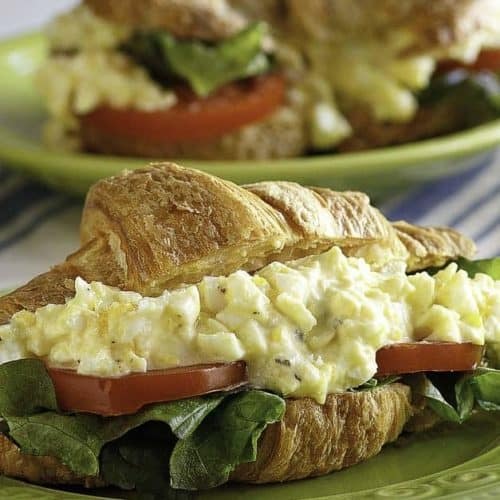 It is a great basic egg salad that can be put together in a matter of a few minutes. Best of all it’s easy to make, and delicious! If you are lucky you live near one of the Chicken Salad Chick restaurants. They are a new chain of fast casual dining that is wonderful! They serve up, guess guessed it, chicken salad, but they also serve egg salad, pimento cheese salad, and all sorts of delicious soups. You always get a sweet cookie with your meal. I don’t know what is better than that! The decor is super cute, it is like stepping into your great-grandmother’s country farm home. The food isn’t complicated, you aren’t going to find dishes like a sweet potato bisque and kale salad. You are going to be served classic dishes we all love. The Chicken Salad Chick Egg Salad is very good, and this is the recipe I have created for you. So until one of these open next to you, you can still enjoy their food. What makes the Chicken Salad Chick Egg Salad recipe special? You don’t need to hunt down exotic ingredients to make amazing food. I bet you have everything you need in your pantry to make this recipe. 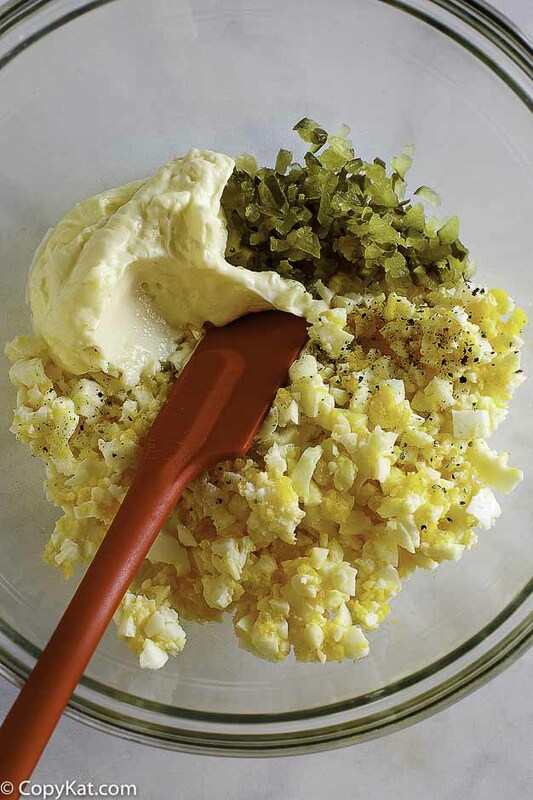 The egg salad simply contains boiled eggs, pickle relish, mayonnaise, salt, and pepper. Getting this in the right ratio makes all of the difference. To cook your eggs, I have a great recipe for making hard-boiled eggs on the stove top, and how to make hard-boiled eggs in your InstantPot. The real difference in this egg salad is the eggs are finely minced. When I make egg salad at home, I normally chop them in small pieces, but their eggs are minced very fine. I think this is one of the reasons the egg salad tastes so good. The flavors mix better when the eggs are chopped super fine. Buy your eggs 7 to 10 days before you want to use them, it will make them easier to peel. When you cook your eggs cool them quickly, by placing them in an ice bath, it will make the eggs easier to peel. If you want it like the restaurant this is served in three ways. It is served by the scoop. Place a large scoop on a plate of leaf lettuce. It is served as a sandwich on Wheat Berry bread, toasted, or not. They will add leaf lettuce and fresh tomatoes. It is served on a croissant with the optional leaf lettuce and tomatoes. I hope you enjoy this recipe! I can’t wait until you get to try one of their delicious salads either made at home or in the restaurant! You made it this far! Be sure to follow me on Facebook. Drop me a comment on Facebook, and let me know what recipe you want to see next! 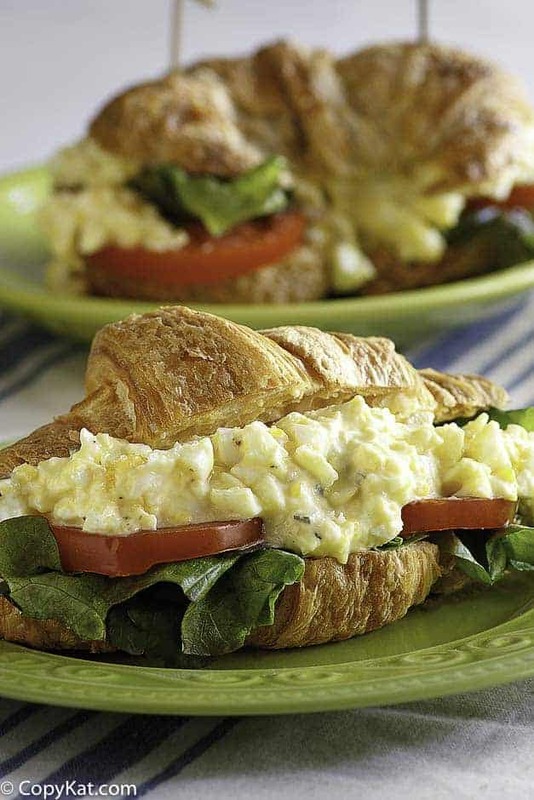 Hands down one of the best egg salad recipes you are ever going to try. Peel hard-boiled eggs. Chop very finely. Mix together mayonnaise, sweet pickle relish, tarragon vinegar, sweet pickle relish juice, salt, and black pepper. Mix in chopped egg very gently. Buy your eggs several days in advance before making the hard-boiled eggs, they are easier to peel between 7 and 10 days old. Cooling the eggs quickly after cooking them makes them easier to peel. 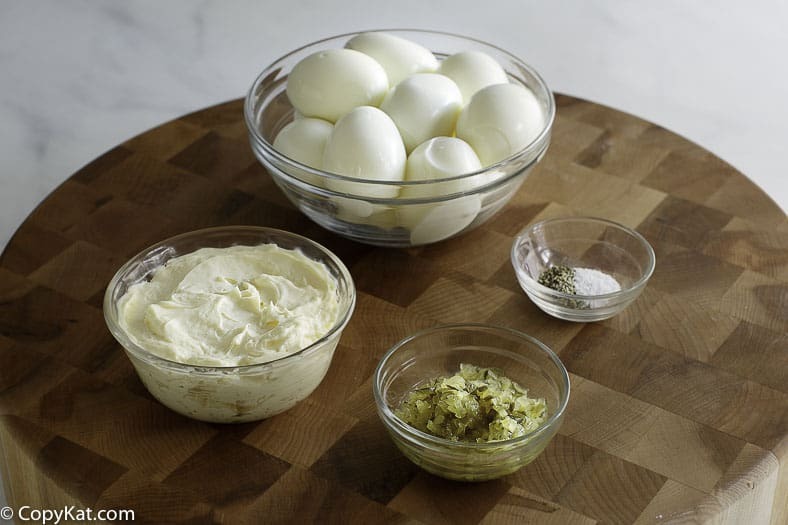 Want to jazz up your egg salad, try adding some fresh dill, and some scallions or red onions. Parsi Deviled Eggs – Indian inspired deviled eggs have cilantro, lime juice, and honey in them to make them delicious. If you hate peeling eggs you probable hate peeling potatoes for potato salad also. Problem solved. Buy a 32 oz bag of frozen small cubed hash browns and boil till soft, but not mushy. Now make your potato salad. I am ok with peeling potatoes 😉 Don’t ask me why. Growing up we raised chickens for eggs. Fresh yard eggs were always so hard to peel. I like your idea about the potato salad 😉 That could become a recipe! Wheres the chicken in the recipe? also i did see someone ask about where the pickle juice went. The restaurant’s name is Chicken Salad Chick, this my copycat recipe for their egg salad. Now in the dairy section, you can BUY bags of peeled hard boiled eggs. BEST thing since sliced bread – if you don’t want to peel – or don’t mind paying a little more. Add salt to the water when boiling eggs, I let the water come to a boil and shut off the heat, let eggs sit in the water 20 mins or longer, drain, then run cold water to cool eggs down..never have a problem peeling them. In addition to the salt, add vinegar to the boiling water. Another similar way to help peeling is to keep the lid on the water and allow to sit about 12-13 min. on the cook top eye. Pour off the hot water and replace with cold water and a big glass of ice cubes. When the ice cubes have melted the eggs are ready to peel. Oh, I just saw this! That is awsome. Just a little thing…recipe mixing says sweet pickle “juice” when blending, but not called for in ingredients. Are you saying to add this? And as a note, our local CSC uses garlic in theirs, which I’m allergic to, so I make my own at home like this. Thank you! Add 1 teaspoon of pickle juice in the recipe. I am glad you can enjoy this recipe. That has to be tough being allergic to garlic! 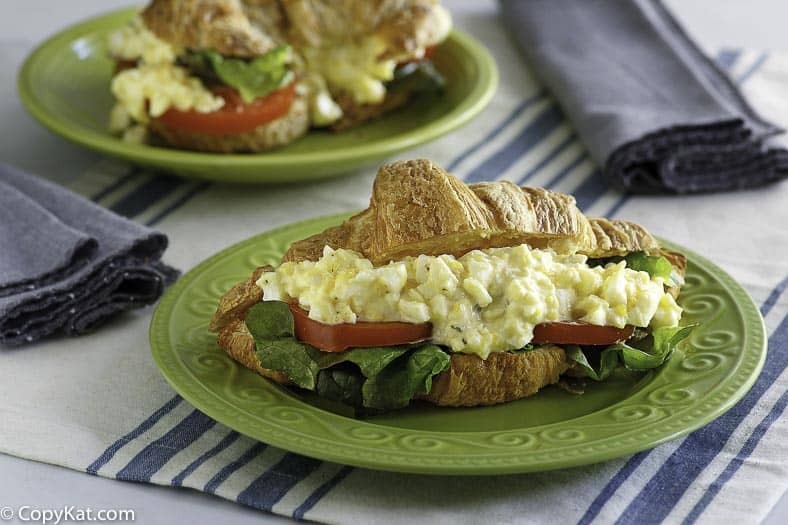 Love Egg salad sandwiches, but hate to peel those darn eggs. don’t peel! do an InstaPot “egg loaf” !!! Man, I gotta try this! I hate peeling eggs! Do you have a pressure cooker or Instant Pot? They make perfect hard boiled eggs that are a snap to peel.